Today’s post looks at Tier 2 in the Police and Fire Retirement System (PFRS). A majority of PFRS members are in Tier 2, which began on July 31, 1973 and ended on June 30, 2009. Most Police and Fire Retirement System members are in “special” retirement plans that allow for retirement after 20 or 25 years, regardless of age, with­out penalty. The special plans that cover municipal police officers and firefighters fall under Sections 384, 384(f), 384-d, and 384-e of Retirement and Social Security Law. As of March 31, 2017, there were 18,553 Tier 2 members in these plans; most of whom are covered by either Section 384-d (34.9 percent) or 384-e (62.8 percent). 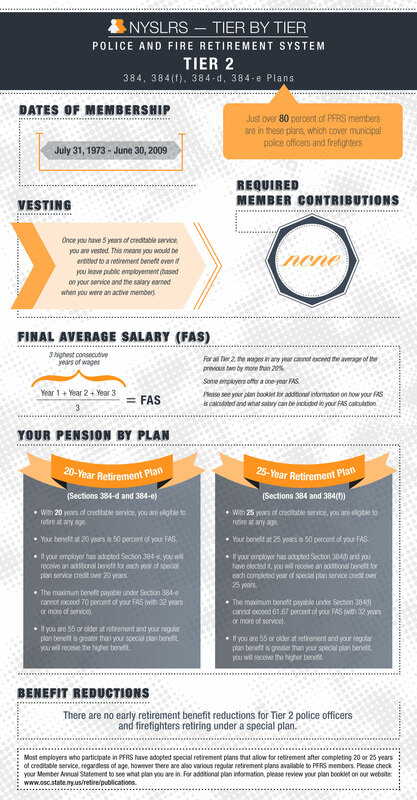 Check out the graphic below for the basic retirement information for PFRS Tier 2 members. *This graphic was updated on 2/19/15. For more detailed information about your benefits, please review your retirement plan publication: Special 20- and 25-Year Plans for PFRS Tier 1, 2, 3, 5 and 6 Members (Sections 384, 384-d and 384-e) (VO1517). Stay tuned for more NYSLRS – One Tier at a Time posts. Next time, we’ll take a look at another one of our ERS tiers. Content last revised August 3, 2017. This entry was posted in General News, Members and tagged benefit reductions, benefits, FAS, Final average salary, members, New York State & Local Retirement System, NYSLRS, PFRS, retirement, retirement age, Service credit, sick leave credit, Tier 2, vesting on February 18, 2015 by NYSLRS. Guess those of us stuck by our employers and the legislature and governor in one of the non-special plans are barely worthy of a footnote. Yipee. Although this week’s post did not cover benefits for PFRS members in plans requiring a minimum retirement age, information about your plan is available on our website at http://www.osc.state.ny.us/retire/publications/index.php#pfrs-plans. If you have specific questions about your benefits, our Contact Center can help. The email address is http://www.emailNYSLRS.com. Can this all change if Cuomo gets a constitutional convention after the vote this November? The New York State Constitution protects your NYSLRS pension benefit from being diminished or impaired. Your pension can only be reduced if the Constitution is amended, and one way to do that is through a constitutional convention. Every 20 years, a question appears on the ballot asking voters if there should be a convention to revise and amend the constitution. This question will be on the November 7, 2017 general election ballot. If voters approve the convention, delegates would be elected the following November and the convention would begin in April 2019. Any constitutional changes proposed by the delegates must be approved by the voters in the following general election. Although there’s no guarantee that a convention would result in changes to public pension benefits, your pension, along with other protections provided by the constitution, could possibly be affected. That is one of several reasons why Comptroller Thomas P. DiNapoli is opposed to the constitutional convention.